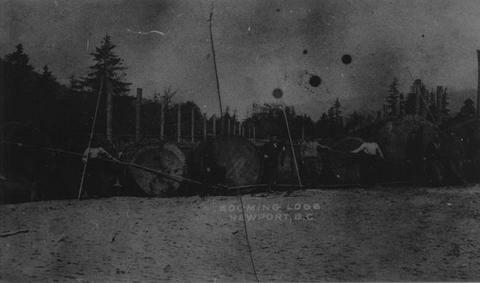 Booming logs in Newport, BC (Squamish, 1904). Squamish's name was changed to Newport in 1911 by the H.S. and P.V.N. Railway and was changed back on September 14, 1914 as the result of a contest for school children. The name had to be changed since there was another town in BC named Newport. The twelve final names considered in the contest were: Newport, Strathacona, Prince Arthur, Kingsport, Great Haven, Columbia, Imperial, Squamish, Pacificgate, Bonaventure, and Viveleroi. Squamish is named for the Indian word "Squohomish" (various spellings) meaning "strong wind".